For those of you who do not know me, I am Svenja Kroeger, a PhD student from the University of Aberdeen (Scotland, UK), and this is my second field season at RMBL. I was here last summer already to help with the data collection for this amazing long-term study, and I am excited to be back again this year! 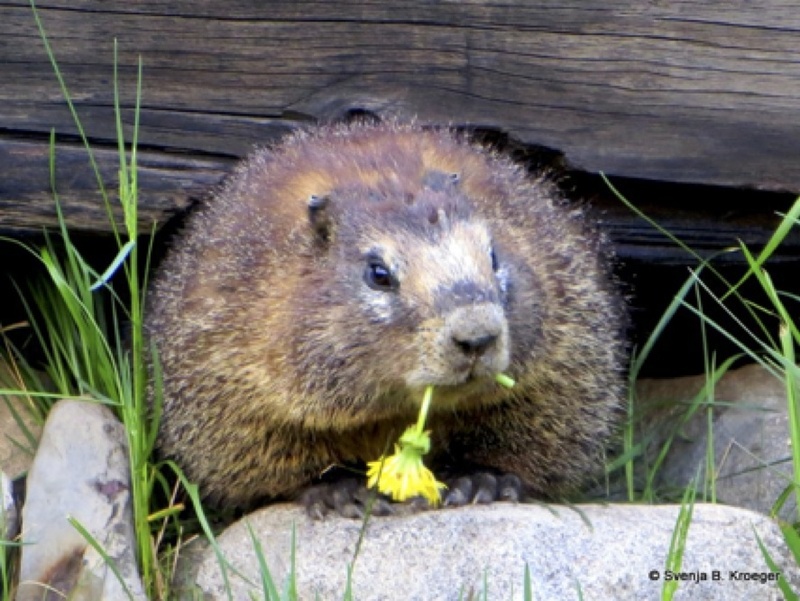 It is fantastic to be close to the marmots again, especially my favourite: ‘Dandelion’. He is a handsome adult male in Gothic town (in fact he is the only adult male in town that we know of), and he has become quite a celebrity at RMBL, as he is rather comfortable with people nearby. I had the honour of naming Dandelion aka ‘Dandy’ last year, and the reason why I chose this name is due to his fondness for dandelions (see picture – ‘Dandelion with a dandelion’). When I arrived here a little over a month ago – to my delight – he was foraging outside my cabin, it was the best welcome I could have hoped for! Regarding the pups - I spotted this year’s first litter at our ‘River’ colony on the 24th June, which is 10 days earlier than last year’s first litter, I believe! When I caught the first pup, there was a little more excitement than I had bargained for however. I was waiting for my trapping partner Gabi to arrive, so that we could process the pup together. Unexpectedly though, the weather turned on us very quickly, and we were caught in a thunderstorm that started right after we were done with measuring and tagging the animal. 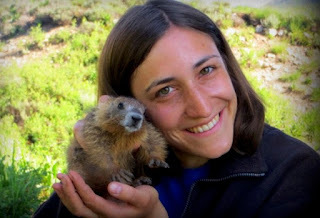 It was stressful and pretty scary, luckily though the marmot pup was safely back in its burrow before the rain started, and Gabi and myself were saved by Dave, who works at RMBL and kindly gave us a lift back to the field station in his truck. It is amazing how fast the weather can change up here in the mountains and it should not be underestimated! So far we have caught and named 7 pups at the ‘River’ colony, including ‘filled-in heart’ (which is the pup I am holding in the picture below), ‘ice-cream’, ‘crescent moon’, ‘cherries’ and ‘007’! There is at least one pup that we have not caught yet, but I am determined to capture it, hopefully next week!